The male bird in Autumn and Winter is similar to the female but may retain the white spots on his forehead. A summer visitor to the UK and much of Europe, winters in Southern Africa. Breeds in the West of England & Wales. Open broad-leaf woodland, usually feeding high in the canopy of mature trees. Often seen in coastal areas during migration. 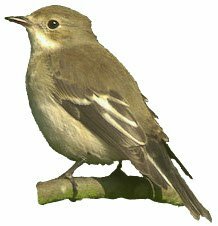 The birds arrive to the UK in April when the males are to be seen flitting from tree to tree in their striking black and white plumage. The females are harder to find, going about the business of nest building and sitting on eggs. The Male usually pairs with more than one female and chooses the first brood hatched to feed, ignoring the other nests. 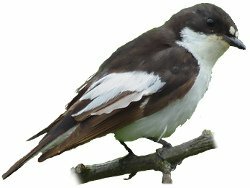 The Pied Flycatcher catches insects on the wing and from foliage. Once the youngsters have fledged the adults move up into the higher tree canopy and become very difficult to see.